Hemp-lime has a low impact on the environment and its carbon sequestration and storage capacity are a significant benefit of the material. During photosynthesis, the hemp plant absorbs carbon dioxide from the atmosphere during the day, converting carbon to biomass and exhaling oxygen. When the hemp is subsequently used in construction, the carbon within it is locked away for the life of the building. Therefore, using hemp within the structure of a building can be better than zero carbon, sometimes referred to as carbon negative. 108kg of CO2 can be locked away in 1m3 of lime-hemp. 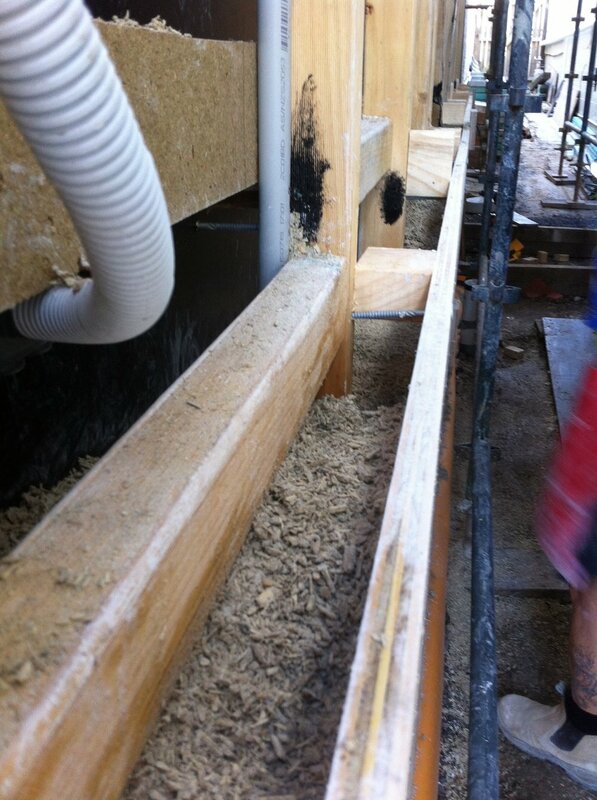 A lime-hemp wall of 200mm depth provides levels of thermal and acoustic insulation well above regulation standard. It also regulates the internal relative humidity and temperature swings ‘through hygroscopic material behaviour, contributing to healthier building spaces and providing effective thermal mass’. The building envelope is vapour permeable which allows moisture in the building to migrate out and eliminates the likelihood of condensation on internal faces. Simplification of the construction process with fewer materials and layers is also a benefit. It is usually where different layers or materials meet that failure occurs and it is also more cost effective to have one material performing many functions rather than many materials each performing a single role. For example, in a standard timber frame construction you may expect to find a layer of insulation, a vapour barrier layer, a breather membrane layer and a sheathing layer to name but a few. However hemp-lime itself can perform all of these functions and, due to the reduction of connections, a more air tight envelope can be achieved. Unlike concrete, lime’s mechanical flexibility allows movement without cracking. If a crack does appear the lime acts in a manner which can self heal. Any moisture ingress re-activates the lime around the crack, filling the void and sealing the material. This flexibility also allows movement with the frame, reducing the risk of gaps appearing between hemp-lime and structure. The Marrickville Hempcrete house is an exciting project that shows how acoustic requirements for aircraft noise can be met, without compromising on thermal performance and aesthetics.The design challenge was to create a better living space for a family of four without increasing the site coverage. The existing footprint has not been increased on the ground floor but reconfigured to improve circulation, usability and connection to the backyard. A mere 35 square meters has been added on the first floor. The result is a generous house that provides three bedrooms, a study, two bathrooms, laundry, generous kitchen dining area and outdoor space on a 197.5sqm site. This is a renovation that incorporates basic passive design principles combined with clients who weren’t afraid to be bold with new materials, texture and colour. Special thanks to a dedicated group of consultants, suppliers and a ambitious builder working collaboratively throughout the process. For more information about the Marrickville House please click here. ACT building company Prostyle Building Group has won the title of 2018 HIA Australian GreenSmart Home – the highest accolade presented at the 2018 Housing Industry Association Lawn Solutions Australian GreenSmart Awards. HIA awards recognise the best in environmentally-responsible housing. Award winners and finalists make a positive difference to the environment by building sustainable, energy efficient and comfortable homes. The winning 2018 HIA Australian GreenSmart Home, located in O’Conner, is one of just 24 hemp houses in Australia and features solar passive design, energy-efficient appliances, LED lighting and a 22,000-litre underground water tank to service the laundry, toilets and garden. The most unique feature is that the home is made of carbon-friendly “hempcrete”, which comprises shredded hemp mixed with a lime binder, and is ideal for the Canberra climate. The judges said what set the home apart from other nominees was its well-considered approach of starting from a base of good passive design and then working through to technologies and products. “The home is at the cutting edge of what is currently the most important global sustainable development goal – zero carbon emissions,” the judges commented. The home’s innovative hemp walls with lime render inside and out are the first of their kind in the ACT. Specialist training was undertaken, which the judges assessed as showing real commitment to educating tradespeople. The home also won the award for HIA Australian GreenSmart Custom Built Home. The home is clever and cost-effective, and boasts an 8.2 star energy rating with technologies that include roof space-to-subfloor air transfer and smart phase change materials. For more information about the Canberra Hemp House please click here.